This is a beautiful looking cabinet with 3 drawers in Macassar. 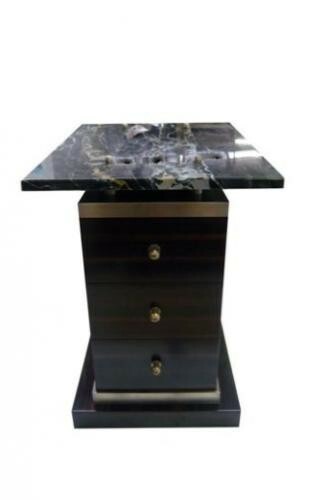 The top is a special marble handpicked for it's pattern and commonly used in Ruhlmann furniture and is fixed with bronzed dome nuts, which are some of the little details that we have studied and introduced into our Art Deco Furniture. The knobs are again, aged bronze, as is all the other metal detail on this lovely piece of furniture.